Week of November 25, 2018 from 4:00 P.M. until 6:00 P.M. The Three Valley Museum will hold its’ annual Holiday Open House on Sunday, November 25, 2018 from 4:00 P.M. until 6:00 P.M. 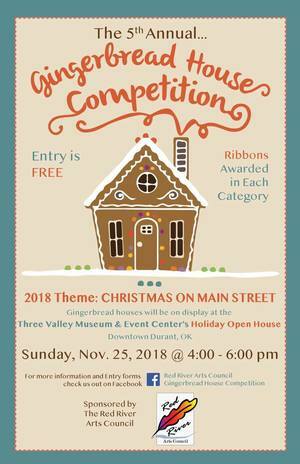 This year, the Red River Arts Council will once again sponsor a Gingerbread House Competition with a $350 prize being awarded by the Iron Horse Art Gallery for the “Best of Show”. If holiday houses aren’t your thing, enter the cookie baking contest. Once again, holiday music will be wafting down Main Street from the Middle School Choir directed by April Raines. Vendors with gifts for everyone will be set up in the R.L. Williams library room. “We hope that you will come help us kick off the Season, enjoy homemade treats, drink a cup of joy, and delight in the sights and sounds of Christmas with your friends.”, said Ferris. Show recipient of the Fifth Annual Red River Arts Council’s Gingerbread House Competition. The event was held in conjunction with the Three Valley Museum’s Holiday Open House recently. Shannan Long, Brianna Sherman, and Shaylin Long created a winter wonder land made up of seven tiny gingerbread houses complete with a lighted ice skating pond and a gathering of gingerbread men playing in the snow. According to Nancy Ferris, Director of the museum and member of the RRAC Board,” the gingerbread event is just one more example of how we promote art in our community”. “Without all forms of art in our daily lives, we would not grow.”stated Ferris. 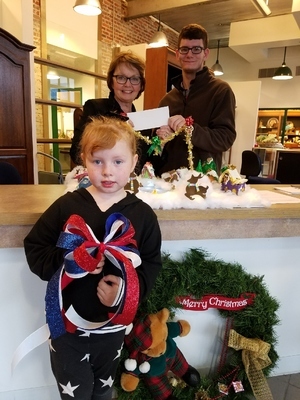 In other placement, Riley Cook won first place in the gingerbread house competition, Becca Williams, second place with her Christmas tree farm, while Lauren Boone and Ashton Cook tied for third place. Lynda Loftin of Mead won first place in the Cookie baking contest with Napoleon’s Hat, and second place with Poinsettia Cookies. The Iron Horse Art Gallery will open soon at 117 South Fifth Street in Durant. Contents © 2019 Three Valley Museum • Site Provided By: Day One Web, Inc.